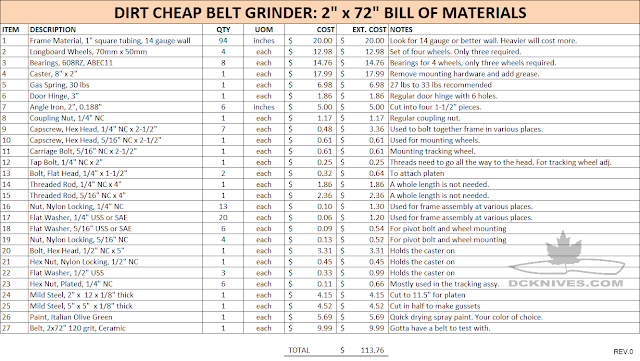 OK, I love belt grinders just as much as the next person, but it's a tough outlay of cash to get into a new grinder. Many folks have asked me about building my variable speed grinder 2 x 72" and lots have used the basic design successfully. That's awesome and thank you for your comments, but can one make a grinder for "dirt cheap?" My aim with this project is to build a reliable, useful grinder for under $200. It has to combine both a flat platen and a contact wheel. It has to use inexpensive, available parts and it has to be simple to put together without a welder. Most importantly it has to accept the standard 2" x 72" belts which knifemakers covet so much. The motor you are going to have pick up yourself. I started with a 3/4 horsepower TEFC from a jet pump. I think 3/4 horsepower is an okay place to start for a sub $200 build. Disclaimer: I offer this information for educational purposes only. I will not be held liable for any use or misuse of the details outlined on this page. It is entirely up to you to know and understand the risks of working with spinning objects, electricity, sparks and chemicals. In this build I've attempted to keep everything as simple and inexpensive as possible. For the most part I've tried to use parts that can be scavenged locally and avoided buying specialty items or things that can only be found at select vendors. Some web sites are listed for your convenience, however I cannot guarantee that an item will be on sale or is still for sale when you read this. Note the tubing I have is galvanized. Plain old steel will be fine especially if you want to paint the frame. 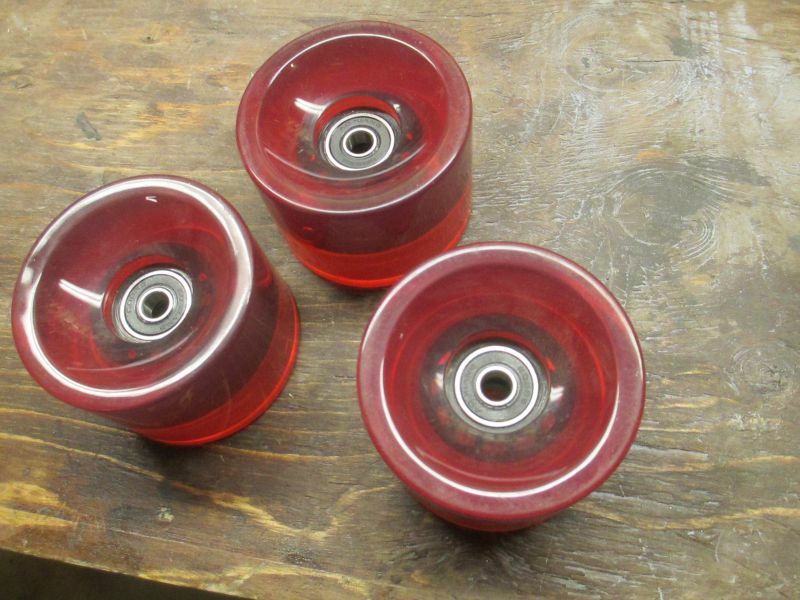 Longboard wheels are common to DIY grinder builds and you can change the bearings easily. To fit the bill they must be at least 2" wide. The ones I picked up on eBay are 2.75" diameter by 2" wide and are commonly sold as 70 mm x 51 mm. The inside dimension on the bearing needs to be greater than 5/16" (0.3125") as these are the bolts that hold the wheels on. The bearings I used are 608RZ, ABEC9 skateboard wheel bearings. The contact wheel is from an 8" by 2" polyurethane on steel caster. These are available online or from caster supply places. Mine is rated for 1100 lbs., but the dimensions are more important than the weight rating for this application. It's best to go to the store see this in person and check the wheel for balance. I checked about five of them and gave them all a spin, then picked the best one. We'll be statically balancing and truing this wheel. If your motor is a 4 pole (1800 RPM), you may want to choose a larger wheel for the drive wheel. 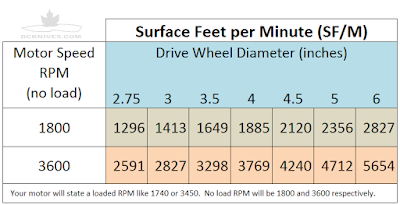 The formula for surface feet per minute is (RPM x Wheel Diameter x pi) / 12. In North America, a two pole motor with a 2.75" wheel is running at a respectable 2591 feet per minute. Half this for a 4 pole motor which I think is too slow. A 4" x 2" crowned caster makes a fair drive wheel and 1884 feet per minute. The tracking hinge can be any 3" standard door hinge. The tracking is adjusted with a bolt through a 1/4" coupling nut. Other than the tubing, there are a few pieces of steel needed. This is common and can be found at Home Depot or a local metal supplier. 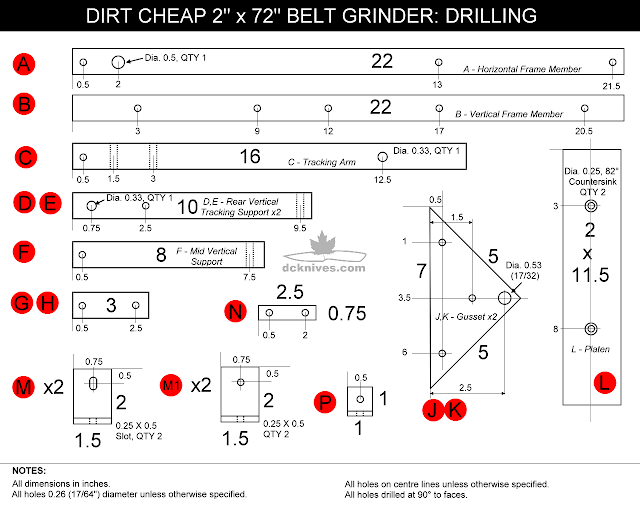 One of the biggest issues with building belt grinders is getting the belt tension correct. I've tried two approaches with this design: the pull spring with a fulcrum and that requires a 120 lb short spring, and the gas spring which is surprisingly easy to install and cheap at surplus places. Try to find one that is between 20 and 30 lbs force that extends about 14 to 17 inches. 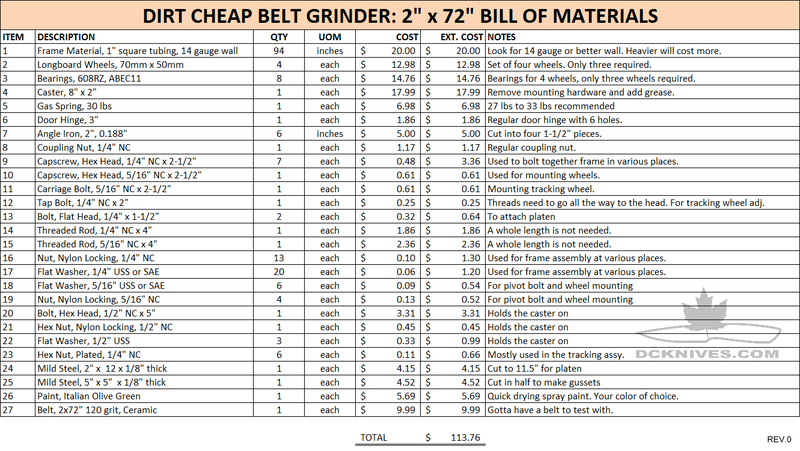 I made a basic Bill of Materials and costed items based on local suppliers. These are in Canadian dollars and mostly retail. With a healthy scrap bin you can build this for cheaper for certain. Although in my build I used Item 1 as 14 gauge (0.83" wall), if you can get some 11 gauge (0.12" thick wall) go for it. This bill may be missing some a few nuts or washers. You are going to have to improvise a little. The first order of business is to cut the square tubing. I was able to cut this on a bench-mounted portable bandsaw and it was quick and painless. If you do not have access to a band saw, use a hacksaw with a fresh 18 tooth/in blade, mark the lines with a square and cut in a vise. Each cut end should be deburred inside and out with a with a file. 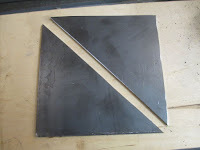 For items J and K, I started with a 5" square piece of 1/8" steel and cut it into two right triangles. For item L, I cut a piece of 2" x 1/8" flat stock at 11-1/2". For the M pieces, I cut a piece of 2" angle iron into four 1-1/2" pieces on the bandsaw. 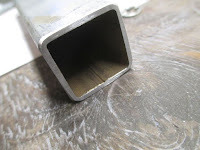 For item N, I cut a small piece of 1/8" steel to 2-1/2" x 3/4". Thicker steel will work here too. 1/4" is okay. Mark the pieces after cutting, so they don't get mixed up when drilling. For all the drilling I used a drill press. It's important to have good right angle holes going through the tubing at 90°. 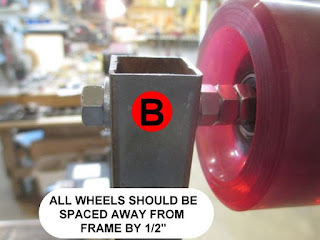 This is key to proper alignment of the wheels. I think there are about 44 holes that need to be drilled and the drill press makes for less work. NOTICE: Thanks to Anthony for pointing this out. The holes shown at 3 and 6" on item B are incorrect on the drawing above. I will correct the drawing shortly. The holes on B need to be 5" and 10". January 21, 2106. Most of the holes are drilled for 1/4" bolts to go through, this hole should be clearance fit for 1/4", and will likely be an F bit or a 17/64" fractional. For the few 5/16" holes (identified as 0.33") a 21/64" fractional bit works well. The 1/2" hole in the items A, J and K can be oversized for clearance at 17/32". Item M is showing four items in the cut and drill drawings. Only two of the four angles need to have slotted holes. The two that are used to attach the platen L to the vertical frame member B should be slotted to allow for platen adjustment. The other two, M1 are for the front feet of the vertical frame member B to mount to your base. M1 only needs 17/64" holes, no slots. Item L requires a countersink to accept a flat head 1/4" NC bolt. I used an 82° 1/2" countersink and kept drilling and checking the bolt until it was flush to slightly below the platen face. I intentionally omitted the 3/16" gas spring mounting holes in the horizontal member A. The location of these holes will depend on the length of the gas spring you source. To make the slotted holes in two of the M1 pieces I drilled two 1/4" holes about 1/4" apart and used a round file to remove the extra material to make the slot. Once all the metalwork is cut you can start assembling the pieces for a test fitting. Refer to the series of photos to test fit. If you wish to paint, you should disassemble after your test fitting, paint and re-assemble. Note that for most of the test fitting I did not use nylon locking nuts. I used nylon lock nuts for final assembly. Also, some of the photos show the assembly after paint. Wherever possible, use a square to make sure the vertical and horizontal frame pieces are at 90°. Let's start with the tracking arm is it's the most complex part and should be assembled before going on the rest of the frame. This is the end view of the tracking arm at test fitting. 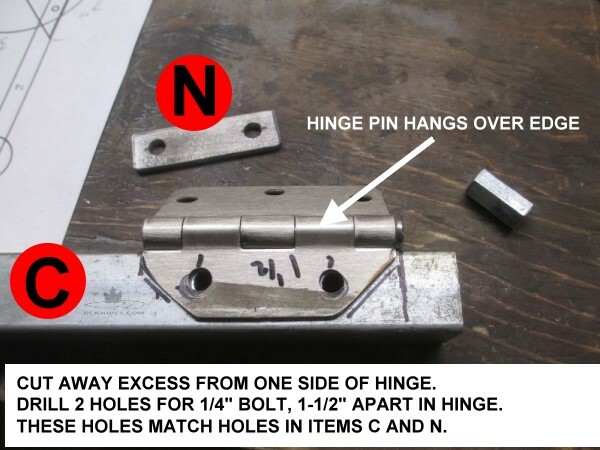 The hinge hangs over the right side of item C. This allows both negative and positive camber. 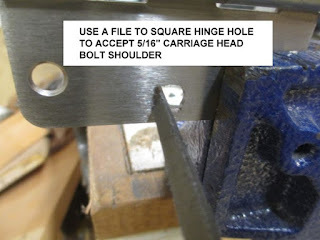 As we are using a carriage head bolt for the wheel axle, we need to square out the middle hole on one side of the hinge. After squaring out the hole, I cut back the opposite side of the hinge. This makes it fit better on the tracking arm. I drilled two holes 1-1/2" in the middle. 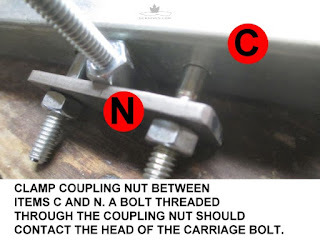 These holes should match the spacing of the holes in the tracking arm C and the coupling nut hold down N.
Here we can see how the coupling nut is clamped. The 2-1/2" x 1/4" NC bolts appear long here, but we will need some length to attached the gas spring later. The tracking wheel itself is bolted on the 5/16" carriage bolt. Some washers and a nut will be needed to space the wheel 1/2" away from the tracking arm C. I have added some electrical tape to effectively crown the wheel and aid in belt tracking. Any 1/4" bolt of suitable length can be made into the tracking adjustment bolt. The handle is a 3" bolt with some black tubing slipped over the shoulder and attached with a nylon lock nut. Assembly of the frame pieces are pretty straight forward. As a rule, for final assembly, when bolting two 1" pieces together I used a 2-1/2" bolt, flat washers and a nylon lock nut. The gussets J and K are attached with 2" bolts. 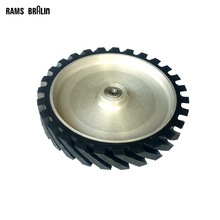 The contact wheel is attached with a long 1/2" bolt, flat washers and a nylon lock nut. Here we also see the gas spring being mounted with some 10-24 by 1-1/2" machine screws and nuts. The position of the gas spring may vary depending on the length of the spring you get. With my contact wheel the gusset and one washer stand the wheel almost exactly 1/2" away from the frame. 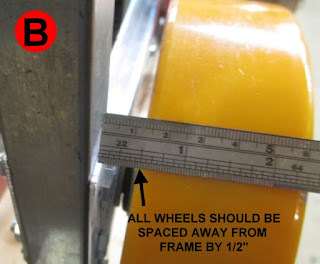 This will be the target distance to set the rest of the wheels away from the frame. Using nuts and washers to achieve this spacing is easy for the the other wheels. This is the top wheel mounted with a 5/16" x 3" bolt. Again we are shooting for a belt to frame spacing of 1/2". I found this worked out pretty close to three nuts and one flat washer with the wheels I have. The pivot for the tracking arm is a 4" length of 5/16" threaded rod with washers and nylon lock nuts. Just below this a 4" length of 1/4" threaded rod holds items D and E to the main horizontal member A. Suitable 4" bolts can work in either of these locations. Note this photo shows the rear pull spring option installed. 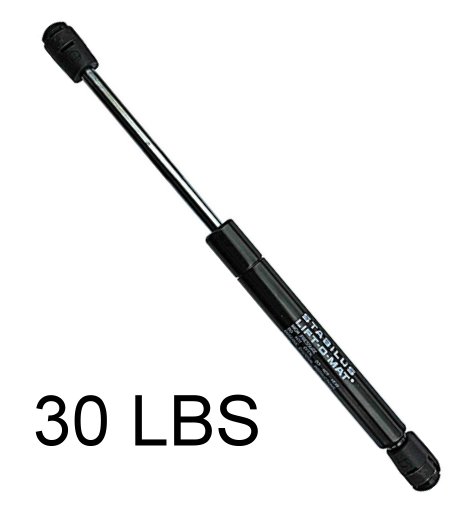 This can be used on lieu of the gas spring if you can find a suitable spring in the 120 to 140 pound range. A different view of the back, post assembly. The platen (L) is mounted to the vertical frame member with two angle brackets (M). The 1/4" x 1/2" slots in the angle brackets allow for adjustment of the platen on two dimensions. When setting up the final platen adjust it so that it pushes the belt away from the top wheel and contact wheel about 1/8". Note that I chamfered the top and bottom of the platen. The platen can be replaced as it wears. 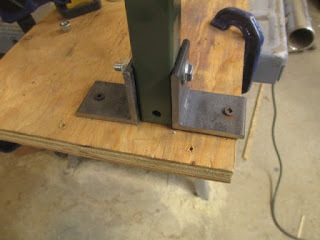 For the front supports I used two pieces of 2" angle iron M1 and bolted them to the vertical frame member B about 1-1/2" from the bottom with a 1/4" bolt. The frame must be mounted to a sturdy surface. If you use wood, make it at least 3/4" thick plywood. For my tests I used a length of 3/4" plywood that was 26" long and 12" wide. I would expect this to be the smallest surface that can be used. I recommend using a 26" x 18" and mounting your motor directly to the base. Items G and H along with the angle iron pieces M1 are used to mount the frame to the wood. 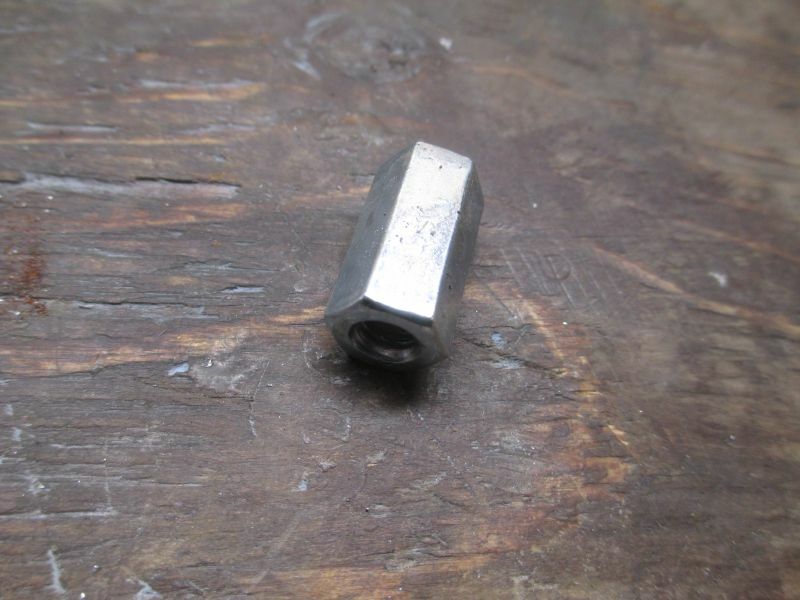 You may use 1/4" bolts with nuts (preferred) or lag screws and washers. The recommended height for the base is 28" to 30", or the tips of your fingers when your hands are relaxed at your side. This height will position your elbows about half way up the platen. The caster wheel will likely be out of balance as purchased, so we must improve it by statically balancing it. This is done by letting it come to a stop and marking the bottom point. Using a larger, say 1/2" drill bit, remove some of the steel in the hub. Give it spin and see where it stops. If it stops with the same spot at the bottom, remove some more steel from the area. Once enough material is removed from the heavy side if the wheel it will randomly anywhere due to friction and not always at the heavy spot. Remove a little from each side as you balance. Although this is not perfect, this will be a huge improvement over the stock unbalanced caster. If the face of the wheel has a wow (out of round) in it you can true the face when the belt is on and the motor is driving the wheel. 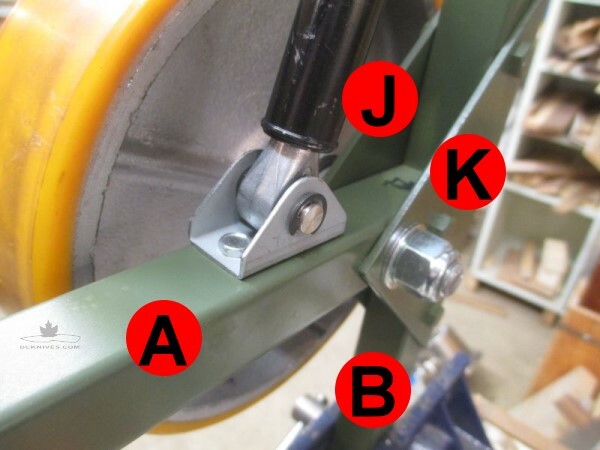 With the unit off, clamp a steel bar or 1" angle iron to the vertical frame member B just above the wheel to act as a tool rest. With a belt on the grinder, power it on and check tracking. Using a sharp chisel against the improvised tool rest, very carefully move across the wheel. Only a small amount of polyurethane should be removed at a time. When buying your caster, checking the wheel face for minimum wow can greatly reduce the truing effort. In the case of my wheel, no truing was required as I chose the best of the half dozen or so wheels at the store. So far there has been little mention of the motor. 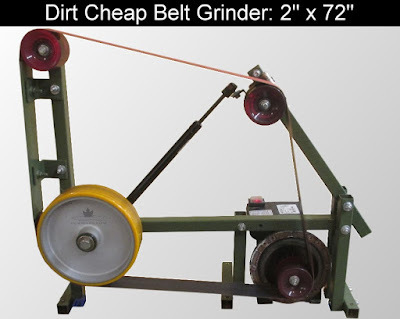 I am expecting that many different motors will be used in the construction of these types of belt grinders. In the earlier section entitled Drive Wheel and Belt Speed we looked at the speed of the belt in relation to the size of the drive wheel and the motor RPMs as related to the procurement of parts. You should be on the lookout for something along the lines of a 1 horsepower motor. 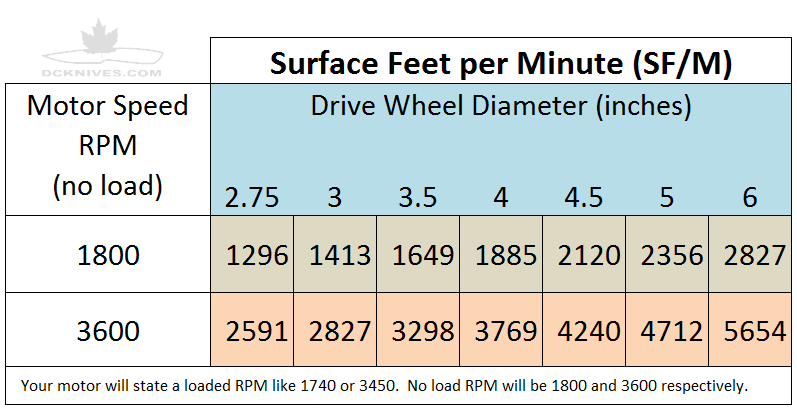 If your motor says its RPM are in the 1750 area, then you will want to use about a 6" drive wheel. If your motor says the RPM are in the 3450 range, then you will be looking for a 4" drive wheel. Most general purpose motors in this size will have a 5/8" diameter shaft. Second hand table saws are a good source of decent electric motors. Motors that have a good starting torque winding are preferred for this grinder design due to the mass of the steel caster it takes a little grunt to get things up to speed. When you power up a motor and after a second you hear a click, that is the starter winding dropping out. A centrifugal switch operates when the start winding and capacitor, then the motor goes into its normal run winding when it's at speed. I live in a rural area and everyone here has water wells. Used jet pump motors are free to cheap. These are almost always fast 2 pole (3600 RPM) kind of motors.3/4 to 1-1/2 horsepower are typical. A Totally Enclosed Fan Cooled (TEFC) motor is preferred for any grinder. The insides are sealed from dust and moisture. The alternative Open Drip Proof (ODP) is a second choice. This doesn't mean the ODPs cannot be used. It's easy to make dust shields to keep metal dust out of the motor. Regular cleaning with compressed air and vacuuming helps prolong the ODP's life as well. I could pay the $53 and freight and order a nice machined 4" aluminum wheel, but your drive wheel doesn't have to be store bought. Here's where this can get interesting and creative. In fact my robust 2 hp belt grinder uses a 4" nylon caster. 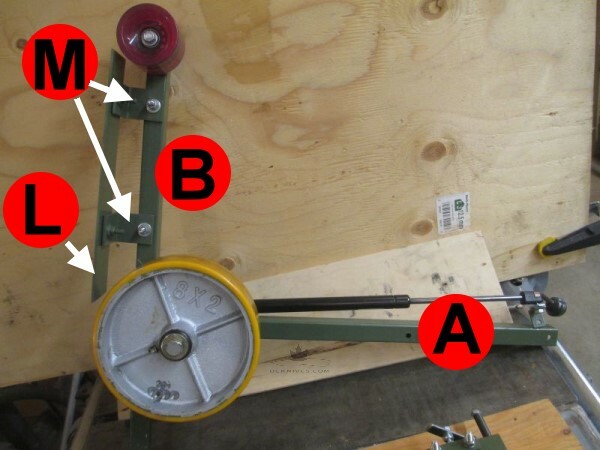 How about turning a drive wheel out of wood? Working on a page for that now. Yes, crown the tracking wheel about 1/8" over 2". This will stabilize the belt and assist in tracking. Hi! First thing first congrats for the blog, it's a gold mine! I already followed some of yours tutorial for the equipment and I made my first knife out of one of yours template (I'm going to send you a photo soon). 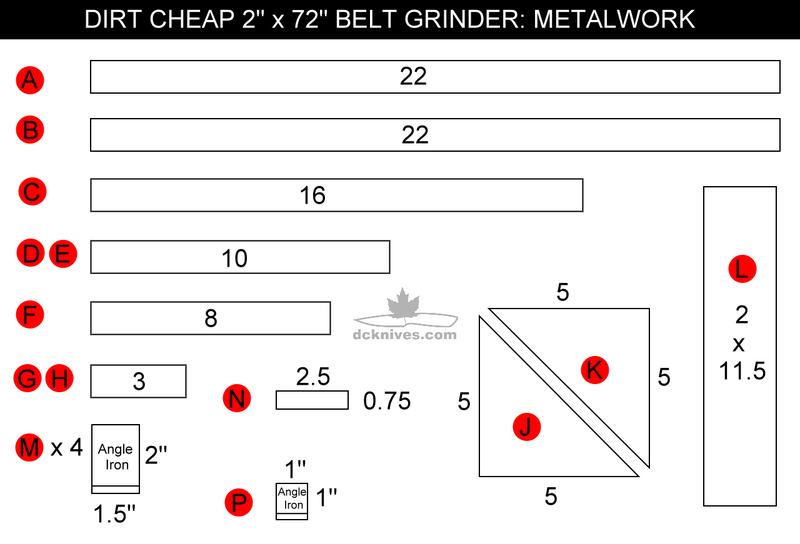 Now I want to try this cheap belt grinder and I was asking myself if it makes a lot of difference if I use Iron instead of steel (using some higher gauge). Thanks again for all the stuff you share! I think it would be fine to use heavier wall tubing. I used 14 gauge and recommend using 11 gauge. Hi Dan. Thanks for all of the useful information. I was wondering if you could give more information on how you attached the drive wheel to the motor. Thanks. The motor and drive wheel I have are unique. Typically you'd have a motor with a 5/8" keyed shaft and a drive wheel which slips on and a key and set screw secure the wheel to the shaft. My motor was a special pump motor so going into detail on that particular setup isn't really useful for most folks. You can see how I made the wheel here. Hello, do you think 11 gauge will work for the steel tubing? Thank you. Yes, 11 gauge is better. A little more rigid for the frame is always better. If you were to add a rest on the front, how might you go about doing so with this design? 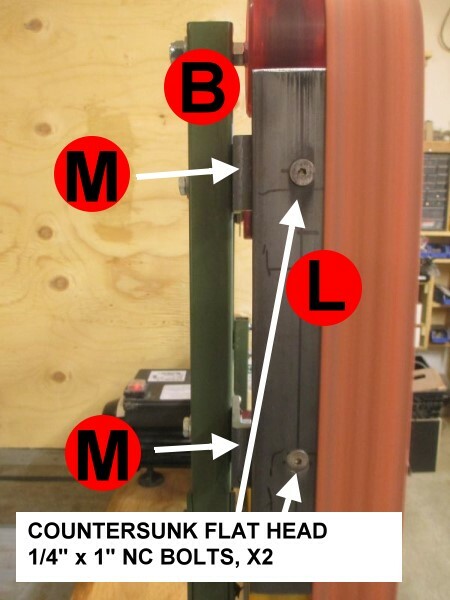 Add the tool rest from the left side of the vertical member B. Use a longer bolt in the lower flat platen bracket M. Optionally, you could create a detent in the tool rest bar to make it stop at exactly 90°. This would be helpful. Could you list a source or part number for your gas spring? I'm only finding the 30lb in an automotive style for liftgates, and they use a ball stud to mount. I'm trying to find the spring which has the flat mount like you use. thanks! Likewise I am also looking for the proper gas spring, anyone have an idea where /part number/ make/ model number? 9417K92 - Heavy Duty 0.16" ID Eyelet Mounting Bracket for Gas Spring. Thank you! Also it looks like there need to be a hole a 7.5" on B for the A frame to mount in line with the rest of the vertical supports. is this correct? 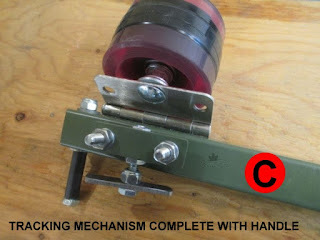 Thanks for your input Dan, Do you think it would be possible to use a skateboard wheel on both ends of the platen, and the caster as the drive wheel? I had a 1725rpm 3hp single phase TEFC motor given to me and need to boost the sfpm. Austin, no problem with the skateboard (longboard) wheels. I've used them on other projects. With a 4 pole motor, look for a larger caster. The slower motor speed can be compensated for with a 5" or 6" drive wheel. What should I ask for when I am searching for the gas spring mount? The A-Frame looking one by the caster wheel? I'd ask for an "Eyelet Mounting Bracket for Gas Spring". McMaster-Carr has them in their catalog as part number 9417K92. http://www.mcmaster.com/#standard-gas-spring-mounting-brackets/=12929rx shows some of such brackets. The one's I got from surplus already had the brackets. You can modify the design to incorporate different mounts. As long is the spring is pushing straight up on the tracking arm. great job and i am building one now, just a quick question: NOTICE: Thanks to Anthony for pointing this out. The holes shown at 3 and 6" on item B are incorrect on the drawing above. I will correct the drawing shortly. The holes on B need to be 5" and 10". January 21, 2106. you mentioned 3" and 6" for the correction, i only see 3" and 9" was this an oversite? Looking to use the 8" caster as the drive wheel on the motor, should make 3612 SFM, and moving the skateboard "Drive" wheel to where the 8" caster would be. Do you think this will require any changes to the design? You will have to move the motor up to clear the base. The tracking arm and platen should be fine with the wheel swap. 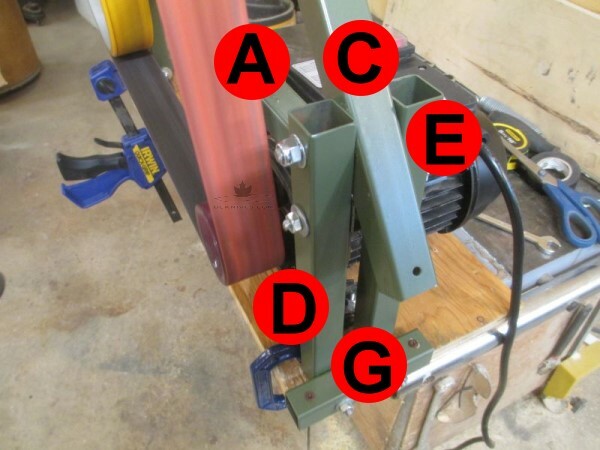 Could you use a store bought bench grinder with a 5/8 arbor to run this application? The thoughts behind this is using one side the drive the sander as you did on your other variable speed grinder...then using the other grind wheel..or swap out for a buffing wheel. Is that possible? Would any adjustments be required? 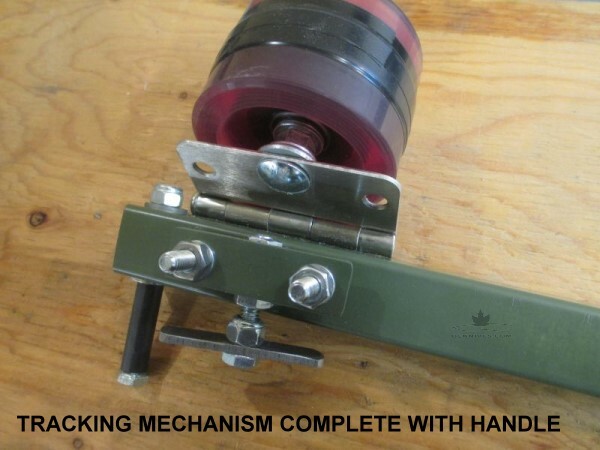 My guess is that the bench grinder will be under-powered to run the long belt and will not have sufficient torque to get the steel caster up and moving. No harm in trying. You can always use the bench grinder as a buffer/grinder if it doesn't work. Hi Chris,makes perfect sense to me. That is the beauty of making your own. Here in Canada belts range from $4 for lightweight aluminum oxide to $25 for a conditioning belt with a good ceramic running around $10.I factor for one belt per knife. Good luck with your build. Please share a photo when it is up and running. Hey! Thanks for your knowledge. I'm looking to build one too. 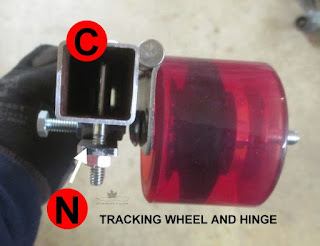 1 question: how to you set up you longboard wheel on the motor shaft? This entirely depends on the motor shaft. The motor I have is a pump motor and has a small threaded shaft which I fitted a nut and welded 5/16" x 2" bolt on to the nut. Different motors will require something different to fit the wheel on. Some are keyed shafts, some are D shafts etc. Is it possible to make the whole frame out of wood? I don't see why it couldn't be made of wood. I've seen similar on YouTube. Check here. Your materials list calls for a 2*8" caster, and you refer to the wheel as a caster several times. Yet there is no caster used with the wheel on any of the photos. 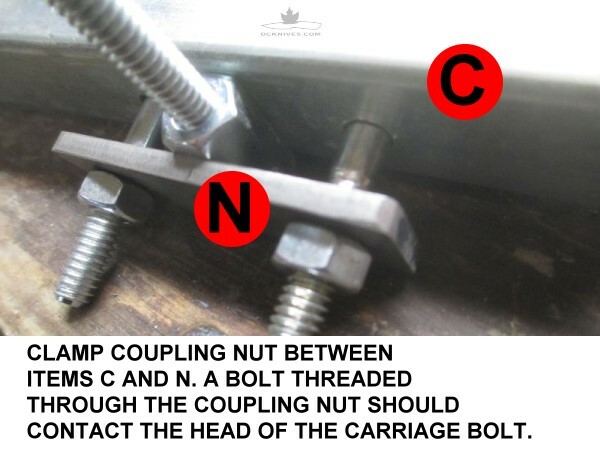 It is attached to the frame with the same bolt that holds the gussets. You mentioned the word caster yet only the 2*8 wheel is used, attached to the frame by the same bolt that holds the two gussets. Could this be made to accommodate wider belts? Using something other than long board wheels? Gr8 build by the way! 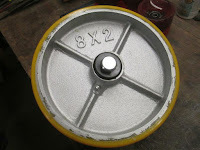 The 8 x 2" wheel is part of the caster as it was purchased complete. I tossed out its frame as I only wanted the wheel. I apologize for the confusion. 2500 sf/m is a good median speed. That will work for most belts from fine to coarse. I guess if you could source wider wheels. 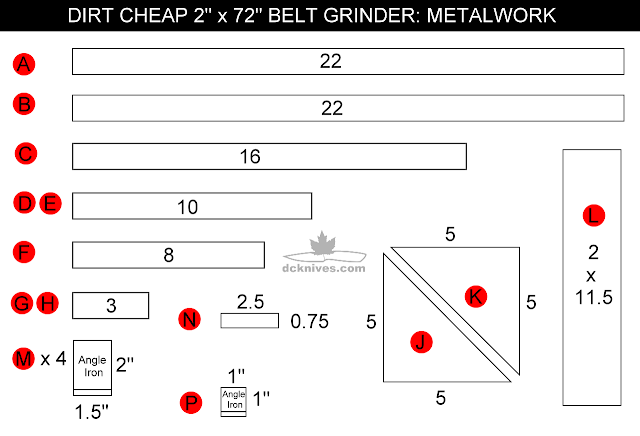 The most common belts for knifemaking are 2" x 72". So you use a steel 8x2 caster but in the completed photo on top, you appear to have used an aluminum caster, did you find the steel caster to be too heavy? It's a cast steel wheel, but painted silver to look like aluminum. I would prefer an aluminum or nylon wheel, but they were more costly/difficult to find. I contacted the caster company warned me that this polyurethane on steel wheel may be dangerous as the heat can lead to the poly coming apart and unbonding from the steel, have you encountered this issue? Hi Adam. This is good to know. I haven't had any issues. I'd imagine the wheel would have to get very warm to cause the adhesive to fail. I am using the roller bearings. They work fine if you grease them periodically. If you want to replace the wheel's roller bearings with lawnmower flanged wheel bearings they only come in 1-1/8" for 1/2" ID IFAIK. What is the name of the metal doohickey that attached the gas spring to the horizontal frame member? My gas spring came with odd looking attachments, i assume they have automotive uses. 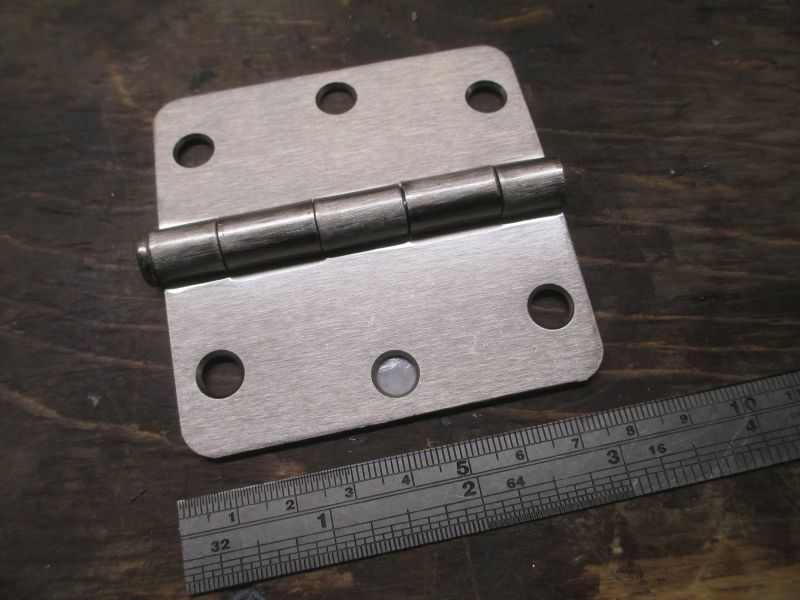 The sort-of-triangular shaped piece at the one end is called an Eyelet Mounting Bracket. They are specifically for gas springs. Mine were from surplus and had the brackets already installed. I believe the springs were intended to hold truck canopy doors open. I got mine on Amazon, they are called "gas spring mounting brackets." They have a standard 10mm ball that pops into the black end cap. You can then weld or screw them in.They also come in various shapes. Any chance you have video of this in action? I'm just about finished mine, missing a few things and waiting on motor. Thanks for all the info! Love when skill and knowledge are willing shared. Just wondering if anyone has had issues with tracking?Skateboard wheels was used,and your design for the wooden wheel. Motor is a 5 hp. We have adjusted and adjusted but it will not track as it should.Had black tape on the wheel on top back. At a loss as to what is causing the issue with tracking. Driving us crazy with what to do to fix the issue. Tracking issues seem to stem from two things, wheel alignment and belt tension. Make sure that all the wheels are on the same plane. Plumb bob, straight edge, laser whatever you have. Secondly the motor shaft must be 90° to the belt path. I checked mine with a framing square. One of the wheels must be crowned to track the belt properly. The tracking wheel works best for this. If using the electrical tape method, make sure the application of the tape is centered and uniform. 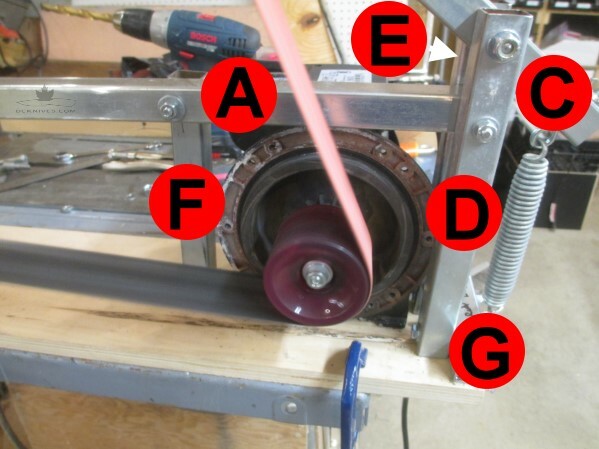 If the tape is on the wheel crooked, the belt wants to wobble side to side. Lastly, check the belt tension. Under tensioned belts will wobble, slip off and generally throw all kinds of tricks at you. Belts should be in the 30 lbs range. I used regular hubs. As long as they are all the same and it doesn't affect alignment you should be good. I just finished building my belt grinder, but I use a drive belt to a spindle on a dual bearing block with a 4" drive wheel on the other side. I have tried 4 motor, but none will turn the belt, which turns easily by hand...two AC tread mill motors (1.5 and 1.25 HP), 1 old AC drill press motor (3/4HP) and a 1HP AC motor I bought at HF. THey all turn like crazy when not hooked to the drive belt, but once attached, they just hum...Any ideas? Sounds like you're not having enough starting torque overcome the bearing and belt resistance. 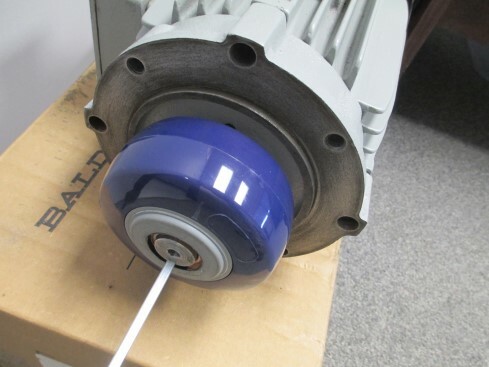 What is the ratio of motor pulley to driveshaft pulley? 1 horsepower should be more than enough to get the belt up to speed. Initially torque is very high at low RPMs, so there must be something else going on here. Can you send me a picture at knives at dcknives.com? Dan I am curious if you could replace the main frame with 2 inch angle or 1 inch angle. Since there is no tapping why would you need to use square tubing? I'm definitely not undermining you because your expertise is way above mine. I'm just up at 3 am and my mind is working. Structurally speaking square tubing is stronger than angle. However heavy angle would be better than light tubing. Heavier materials reduce the effects of vibration. I cannot see a reason other than any geometry reasons (how things fasten together) why you couldn't use angle. Dan did you run into any issues with the gas spring causing the rear legs to kick inwards when it isn't compressed? Is this simply resolved when the frame is bolted down? I'm test fitting and this keeps happening.